... a member of the Communist party. That's the completion of the wordy title of this play, or at least one variation of it. It refers to questions posed by Joseph McCarthy and his senate subcommittee to the African-American poet and suspected Communist Langston Hughes in 1953. This new play at the Guthrie Studio Theater,* written by Carlyle Brown (who also wrote the moving play American Family which premiered at Park Square a few months ago), is about Langston Hughes and his experience with McCarthyism. But it's really about so much more. It's about who he was as a man, as a writer, as an activist, as well as what was going on in America during the time he was writing (with possible parallels to today). Gavin Lawrence plays Langston Hughes, and it's worth noting that he starred in American Family opposite the playwright and Noël Raymond, who directs this play. These are frequent collaborators who continue to work well together. 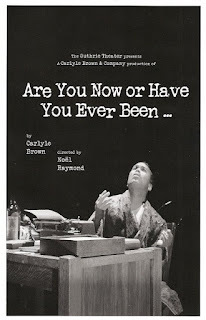 And in this case, Gavin's portrayal of Langston Hughes is one of the best performances I've seen on stage this year. He fully inhabits this character and brings him to life before our eyes. He speaks directly to the audience, looking us in the eye, engaging us and making us feel like a part of the story. He "reads" long segments of books and articles, recites poetry (with the words displayed on a screen behind him), talks on the phone, talks to himself, talks to the audience, all seamlessly and organically. I know I shouldn't be, because it's their job, but I can't help but be impressed by actors who memorize long monologues. This is basically a one-man show for the first hour. And he never stops talking and being this man. I must confess: I've never been able to get into poetry; reading a printed poem does nothing for me. And I know next to nothing about Langston Hughes. But when Gavin as Langston reads these poems out loud, I get it. He brings these beautiful words to life in the most wonderful way - he performs them, he lives them. I could listen to him read poems for two hours, and this is coming from someone who's not generally a fan of a poetry. There are lots of interesting and worthwhile things about this play, but for me it's all about Gavin Lawrence's performance. After about an hour of this phenomenal one-man show, the action moves to the actual subcommittee proceedings as McCarthy and three others pepper Langston with questions about his poems, his travels, and his beliefs. 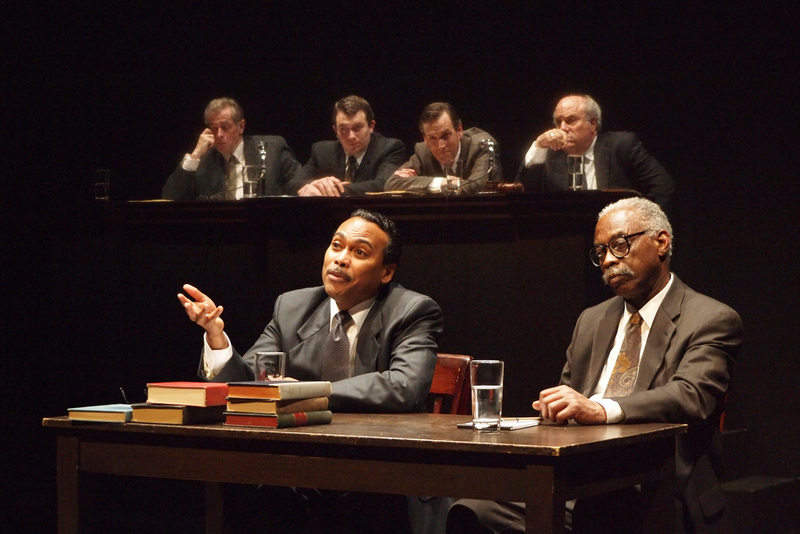 They're seated at a high desk behind the screen, as Langston sits with his lawyer (played by the playwright) facing the audience. The questions are ridiculous and paranoid, and Langston fends them off as best he can. There's no real resolution to the scenario. Only silence as the committee members walk out. One last poem is displayed on the screen, which the audience is left to read silently to themselves. As I was looking for a seat in the general admission seating of the Dowling Studio, I spotted a sign that said "reserved for Joe Dowling." Yes, the man for whom the theater was named, and Artistic Director of the Guthrie, was in the house! *I received two complementary tickets to attend Are You Now or Have You Ever Been... as part of the Guthrie's "Blogger Night."